We went to a party today! It started off with Mass followed by outdoor Stations of the Cross. There is a new homeschooling group just starting up at the local parish where the children and I go for daily Mass. They decided last week to have a St. Patrick's Day Party and everybody pitched in to make it a big success. We dressed in ( a little) green and brought green food and broomsticks to give the older children a chance to try their hand at hurling. One mom who is from Ireland made authentic Irish soda bread using her mother's cousin's recipe. She admitted that it was her first time making it. Talent must be in the genes because it was amazing! (aside): Nothing like the first time I tried making it. Husband and I were dating and I wanted to impress him with my culinary skills (ha!). I knew that his family all had Irish names so I made some authentic Irish soda bread from an old country Irish cookbook I bought when I was in Ireland. You know the kind of book I am talking about? Authentic. Country. No real unit of measurement! My bread tasted like a salt lick! And it was probably as hard as one too. There were brownies and cookies with shamrocks on them, spinach nuggets and a spinach artichoke dip served in a bread bowl. The little guys made shamrock necklaces and St. Patrick shields. They read a story, watched a movie and generally had a good time. Some of the moms with little ones had to leave early because the timing wasn't great for the kiddos. Boy, do I remember those days! I was so proud of these moms for even trying at all. I didn't have that kind of courage when mine were smaller. Us moms got to meet face to face instead of communicating through email only and do what moms do best... talk! There was a lovely lady there that I didn't get to talk to except briefly before she drove away. I would love to get to know her better and hope to have that chance in the future. Our food contribution included this Pistachio Nut Bread with a lovely green glaze. No, not teal... I said green! Hey, no giggling! And an Irish Flag veggie tray. This was not my idea so I can only take credit for the execution. Another family in the group emailed saying that they would bring one but then they had to cancel. I thought it was such a great idea that I offered to try it. It was fun, super easy and a healthy alternative. 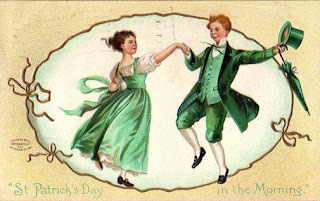 This weekend is shaping up to be a very busy one so I wish all of you a wonderful Feast of Saint Patrick Day! Oh my goodness! I just saw your post on the Real Learning forums about laying grass seed, and I replied telling you that I'm in Houston and more about snakes and whatnot. Anyway, you mentioned that you were in North Texas, which is where I grew up so I came to look at your blog. Lo and behold there is good old SEAS in your photographs...that was my parish! My husband and I were married there almost 4 years ago. My parents still go there along with my 4 little sisters (all under 8 BTW lol). Anyway, I thought it was a fun coincidence!!! I just posted a really long reply to you about the snake thing (sorry I got a little wordy!) and then I saw your comment here. What a small world! Does your mom homeschool? If she does, please tell her about the new group they have started. Even if it wasn't your idea the Irish flag veggie tray is wonderful. You did a great job in the implementation. I am going to have to remember that for next year.